Phill Niblock - Niblock For Celli / Celli Plays Niblock. Vinyl LP. Bleep. 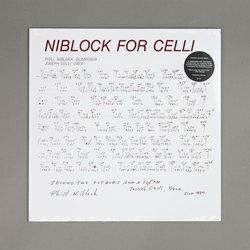 Niblock For Celli/Celli Plays Niblock is not, as one might expect, a series of Phill Niblock compositions for massed cello ensemble. Rather, it is two pieces that the legendary NYC avant-garde musician wrote for reed player Joseph Celli - a former collaborator of Ornette Coleman and John Cage, no less. Both the entries here are built on drones, though while ‘Second Two Octaves & A Fifth’ is bright and resonant the B-side cut ‘First Performance’ is angularly discordant. This LP was originally released in 1984 and is now being reissued by Superior Viaduct.